Clearly, trade and finance are not organized, in Africa or the world at large, with a view to liberating a popular movement. 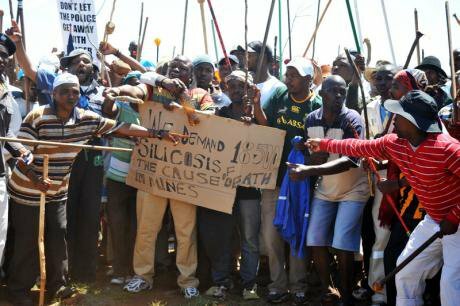 South Africa miners strike following the Marikana massacre, 2012. Demotix/Jonny White. All rights reserved.We live in a racist world. Despite the collapse of European empire and the formal adoption of a façade of international bureaucracy, the vast majority of black Africans are still waiting for meaningful emancipation from their perceived social inferiority. Now there is much talk of economic growth in Africa. In the present decade, 7 out of the 10 fastest-growing economies (as conventionally measured) are African. In 1900 Africa was the world’s least densely populated and urbanized continent with 7.5% of world population. Today it is double that, with an urban share fast approaching the global average. According to UN projections, Africa will be home to 25% of all the people alive in 2050, 40% in 2100 (when Asia will contribute 42% and the rest 18%). This is because Africa’s annual population growth rate is 2.5% while the rest of the world is ageing. The Asian manufacturing countries already recognize that Africa is the fastest-growing market in the world. This could provide an opportunity for Africans to play a stronger hand in international negotiations. If they succeed in standing up for themselves, it would be a world revolution, the end of the racist world order, no less. The movement to abolish slavery was officially completed in the late nineteenth century. But emancipation is rarely as simple as that. In West Africa, abolition was a disaster. The internal drive to capture slaves continued apace and, despite a shift to their use in domestic production, supply soon exceeded demand. The price of slaves fell drastically, leading to their widespread abuse. Colonial empires were then justified by disorder in West Africa and by the drive to abolish the Arab slave trade in East Africa. Much later, when these regimes fell, Africans were offered emancipation once more, this time through national independence. Most African economies then regressed for a half-century. Apartheid was defeated in South Africa, but two decades later the country is more unequal and unemployment is rampant, while the government shoots its own people if they complain. Africans are still waiting for equal membership of world society. But they have never encountered more favourable conditions than now. In the twentieth century, a population explosion was accompanied by a jump in Africa’s urban share from under 2% of the population to almost half. This urban revolution is not just a proliferation of cities, but also involves the installation of the whole package of pre-industrial class society: states, urban elites, intensification of agriculture and a political economy based on extraction of rural surpluses and the city bazaar. The anti-colonial revolution unleashed hopes for the transformation of an unequal world. These have not yet been realized for most Africans. Africa’s new leaders thought they were building modern economies, but in reality they were erecting fragile states based on the same small-scale agriculture as before. Either machine production would be developed in some sectors of the economy or the state would devolve to a level compatible with its small-scale productive base. This structural weakness inevitably led them to exchange the democratic legitimacy of the independence struggle for dependence on foreign powers. Life support to Africa’s new ruling elites was switched off in the early 1980s. Many governments were made bankrupt and some countries collapsed into civil war. The growth of cities should normally lead to rural-urban exchange, as farmers supply food to city-dwellers and in turn buy the latter’s manufactures and services. But this progressive division of labour requires a measure of protection from the world market and it was stifled at birth in post-colonial Africa by the dumping of subsidized food from the tax-rich West and later of cheap Asian manufactures. ‘Structural adjustment programmes’ imposed by the World Bank and IMF meant that Africa’s fledgling national economies had no protection. Tax collection in Africa was never as regular as in Eurasia; and governments still rely on whatever they can extract from mineral royalties and the import-export trade. Rents secured by political privilege are the chief source of wealth. This constitutes an Old Regime ripe for liberal revolution. ‘Development’ refers first to humanity’s hectic dash from the countryside to the city since 1800. The engine driving this economic growth is assumed to be ‘capitalism’. Development then means trying to understand how capitalist growth is generated and how to make good the damage it causes in repeated cycles of creation and destruction. A third meaning refers to the developmental states of the mid-twentieth century, the idea that governments are best placed to engineer sustained economic growth with redistribution. The most common usage, however, refers to the commitment of rich countries to help poor countries become richer. This was at first real enough, even if the means chosen were often flawed. But after the 1970s, it has faded. If the rapid growth of the world economy encouraged a belief at first that poor countries could become rich, from the 1980s ‘development’ has meant freeing up global monetary flows and applying sticking plaster to the wounds inflicted. Development is the label for political relations between rich and poor countries after colonial empire. There are two pressing features of our world: the unprecedented expansion of markets since the Second World War and massive economic inequality between (and within) nations. Becoming closer and more unequal at the same time is a recipe for disaster. Africa, with a seventh of the world’s population, had 2% of global purchasing power around the millennium. What could Africa’s new urban populations produce for the world economy? Apart from exporting raw materials, when they could, the world market for food and other agricultural products is skewed by western farm subsidies. Manufacturing as an alternative faces intense competition from Asia. African countries should argue collectively in the councils of world trade for some protection from international dumping, so that their farmers and infant industries might supply their own populations first. Exchange between cities and their hinterlands has been frustrated for a post-colonial Africa whose international bargaining position is undermined by being fragmented into 54 states. The fastest-growing sector of world trade is the production of culture: entertainment, education, media, sports, software and information services. The terrain is less rigidly mapped out here than in agriculture and manufacture and Africans are well-placed to compete in this field because of the proven global preference for their music, films and plastic arts. 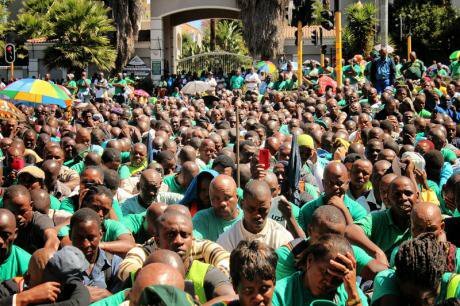 Mineworkers and Construction Union members remember the Marikana victims, 2014. Demotix/Antonella Ragazzoni. All rights reservedThe classical liberal revolutions were sustained by three ideas: that freedom and economic progress require increased movement of people, goods and money in the market; that the political framework most compatible with this is democracy; and that social progress depends on science, the drive to know how things really work. The energies generated by Africa’s urban revolution are already manifested in economy, technology, religion and the arts; and they could be harnessed to radical change if freed from the Old Regime. Rousseau’s condemnation of eighteenth century France rings as true for our world: “It is manifestly contrary to the law of nature, however defined… that a handful of people should gorge themselves with superfluities while the hungry multitude goes in want of necessities”. The institutions of agrarian civilization are alive and well, not just in post-colonial Africa. The greatest riches are no longer acquired through selling products cheaper than one’s competitors; rents secured by political privilege -- such as Big Pharma’s income from patents, monopoly revenues from DVDs and CDs or tax revenues, used to bail out the Wall Street banks – keep the superrich afloat today. In The Wretched of the Earth, Frantz Fanon provided a blueprint for a class analysis of decadent societies ripe for revolution. Political parties and unions were weak and conservative in late colonial Africa because they represented only a tiny part of the population: the industrial workers, civil servants, intellectuals and shopkeepers of the town, classes unwilling to jeopardize their own privileges. They were hostile to and suspicious of the mass of country people. The latter had customary chiefs supervised by the military and administrative officials of the occupying power. A nationalist middle class of professionals and traders confronted the superstition and feudalism of traditional authorities. Landless peasants joined the urban lumpenproletariat. Eventually colonial repression forced the nationalists to flee the towns and take refuge with the peasantry. Only then, with the rural-urban split temporarily healed by crisis, did a mass movement take off. Fanon’s method might help us identify the potential for another African revolution. Clearly, trade and finance are not organized, in Africa or the world at large, with a view to liberating a popular movement. A liberal revolution would need allies with significant wealth and power. Africans will have to develop their own transnational associations to combat the huge coalitions that would deny them self-expression. One of the strongest political movements today is the formation of large regional trading blocs in response to neoliberal globalization. A national framework for development never made sense in Africa and it makes even less sense today. The coming revolution could leapfrog many of the obstacles in its path, but not if African societies still wear the national straitjacket they inherited from colonial rule. The American, French and Italian revolutions all combined mass insurgency with an extended period of warfare focused on removing fragmented sovereignty, unfair taxes and restrictions placed on movement and trade; German unification had a similar focus, but followed a different political trajectory. The success of the British in establishing a global free trade regime in the nineteenth century and the revival of that regime as economic orthodoxy today have obscured the complex dialectic of freedom and protection whose imperatives were laid out by Sir James Steuart in Principles of Political Economy (1767). Impediments to trade caused by divided sovereignty within and between states had to be overcome. Development under these circumstances depended on removing these barriers to trade. At the same time, these incipient free trade areas needed a measure of protection, so that their own agriculture and manufactures could benefit from supplying newly consolidated home populations. The French revolution is a striking case in point. In 1793, the Terror was unleashed and the Bretons raised a ‘Royal and Catholic Army’ against which the revolutionary Republic sent out an army of its own to fight in the War of Vendée. Nantes, France’s largest port, was heavily involved in slavery and trade with the Caribbean. It stood out for the Republic and was besieged by the Royalist army. The ensuing battle was decisive for the Revolution; the shippers financed the Republican army. Why did the Nantes bourgeoisie risk so much for the Revolution? France, although a central monarchy, was then a patchwork of local fief-holders, each of whom exacted what they could from people and goods moving through their territory. The Republic promised to end all that and establish a regulated home market. The Nantes shippers wanted to reduce the costs of moving their trade goods inland and so they allied themselves with the Republic. In the United States, American and Dutch smugglers led resistance to the East India Company’s tea monopoly and to British taxes offsetting the crown’s military costs. The Italian Risorgimento too was backed financially by the industrialists of Milan and Turin who wanted a national home market freed of territorial fragments and unrestricted access to world trade. In all three cases, the power of merchant and manufacturing capital played a decisive part in the revolution. Long before the European Common Market became the European Union, the Prussian Zollverein was launched in 1818 and culminated in the German Empire. In each case political unification was preceded by a customs union lasting half a century. The Zollverein was a piecemeal attempt to harmonise tariffs, measures and economic policy in scattered territories controlled by the Prussian ruling family. The Germans attributed their vulnerability to extreme political fragmentation (some 40 states in 1815). Prussia’s main aim was to expand a protected zone of internal free trade from which the Austrians were excluded. By the 1860s, most of what became Germany had joined the customs union. Their leading economist, Friedrich List, proposed a ‘national system’ of political economy. He emphasized the scope for innovation within an expanded free trade area protected from the world market. Similar proposals were espoused by Americans like Alexander Hamilton and Henry Clay. President Mbeki’s idea of an ‘African renaissance’ expressed the belief that a black majority government in South Africa might be a catalyst for an African economic revival based on greater political coordination between what had before been easy pickings for the world’s great powers. His initiative was aimed exclusively at the very political class that has failed Africa so often since independence. He did not factor civil society movements into his plans. Africa currently consists of a labyrinthine confusion of regional associations which do little to strengthen their members’ bargaining power in world markets. On the ground, however, African peoples maintain patterns of long-distance movement and exchange developed over centuries despite their rulers’ attempts to force economy and society into national cages. This is one major reason why so much of the African economy is held to be ‘informal’: state regulations are routinely ignored, with the result that half the population and most economic activity are criminalized and an absurd public effort is wasted on trying to apply unenforceable rules. Classical liberalism offers an answer to this chaos -- the widest area possible of free trade and movement, with minimal regulation by the authorities. Neoliberal globalization has done much to discredit this recipe, since political initiatives, even in pursuit of free trade, are anathema. Yet the policy conclusion is inescapable: the boundaries of free commerce and of state intervention should be pushed beyond the limits of existing sovereignties. China occupied a similar slot to Africa in western consciousness not so long ago. In the 1930s, people often spoke of the Chinese as they do of Africa today. China was then crippled by the violence of warlords, its peasants mired in the worst poverty imaginable. Today the country is an economic superpower. This profound shift in power from West to East does not guarantee that Africa will escape soon from the stigma of inferiority, but the structures of North Atlantic dominance that once seemed inevitable are perceptibly on the move; and that makes it easier to envisage change. Humanity is entering a new era of social possibility. Africans’ drive for emancipation from an unequal world society affects all of us. In that sense an African revolution would be a world revolution.